The web addresses at places like Google Maps, Amazon.com, Expedia, eBay Auctions, Digg.com or even Google Searches are often long, cryptic and almost impossible to remember. Thankfully, there exists more than a dozen URL shortening services on the Internet that convert them these extra long URLs into short and sweet links that you can easily copy-paste in emails, Usenet groups, IM's or even SMS text messages. Here's a quick review of the most popular URL redirection servicesto help you pick the right one for your job. urlTea.com - A relatively new but promising URL shortening service. It allows you to describe or annotate the destination website in the short URL itself. 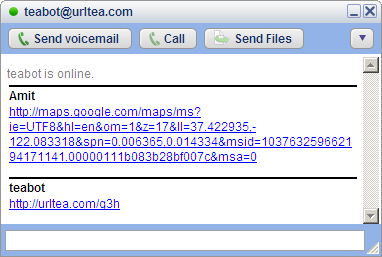 For instance, http://urltea.com/g20 is the same as http://urltea.com/g20?my_site but the latter makes more sense to the visitor. And you can also use Google Talk or Yahoo! Messenger to create short URLs through a buddy called teabot@urltea.com. SnipURL.com - With SnipURL, you can choose your own web address with some meaningful text instead of using random addresses generated by tinyurl.com. This will help visitors get an idea of what they are about to click. It is possible to modify the underlying URL without changing the existing SnipURL address. Best of all, SnipURL can generate private URLs that can only be accessed after providing a password. Shorl.com - This may well be the favorite URL redirect service for bloggers and website owners since it provides usage statistics of your short URLs (i.e., Number of Hits). When a user clicks a URL created by shorl.com, he is shown the web address of the destination for few seconds before the actual redirection. Now that's an intelligent design since users can opt-out even after clicking the short URL. Nothing deceptive about it. Final Thoughts - Shorl.com gives control in the hands of the user and automatically increases the level of trust. SnipURL gives you click through stats and more control over URL text so that makes it my favorite URL shortening service.